Along with a group of other enthusiasts in the early 70’s I visited the Provincial Hoeford garage on a trip from Eastbourn. The outing was organised by Clive Wilkin on a most unusual vehicle, namely an East Lancs bodied Guy Wulfrunian. One of the pair new to Accrington Corporation but by then owned by Ronsway of Hemel Hempstead. These two were unique in that they were 28ft long with open rear platforms a Gardner 6LW engine and manual gearboxes, our steed for a very interesting day was ex Accrington No 156 registration 35 VTF. Very interesting, Dave. I have a "bought" slide from the Dale Tringham collection, probably taken on that same visit, which Dale has as March 1969. It was quite clearly taken at Hoeford, as evidenced by the tram tracks. Either way, most Wulfrunians didn’t seem to have very long lives with their original owners. I think those which went new to West Riding lasted longest in that category. There was a particular reason for the spec of these vehicles – but I’ve an article in preparation for submission very early in the New Year where they feature, so I’ll leave it until then. I’d heard about these. Pretty bizarre really. Can you remember what happened in the space where the engine/front NS wheel ought to be? It has a door, but the driver had an engine in the way of his cab, presumably- so did it connect to the passenger space? Was it for the conductor, to maintain meaningful dialogue with the driver? Were there no Arabs to be had then? No doubt Phil will reveal all? Pete- West Riding became the resting place for homeless Wulfrunians, until- possibly- NBC arrived with the resources to replace them, sometimes with older Lodekkas etc. I think these two were an oddity too far, though. Too odd even for West Riding, Joe? Wait a while, there’s something in the pipeline that’s even more extreme! Joe, the floor level at the front seems quite high, given that there’s a substantial step up to access. And can I make out what looks like a bulk-head and window to the right of what looks like somebody standing next to the driver? Perhaps the door was for no other reason than to allow access to the engine compartment. If Diesel Dave rode on the beast then perhaps he can enlighten us . . . I recall reading somewhere that the absence of a front entrance on these vehicles allowed the engine to be positioned in the centre-line of the vehicle rather than off-set to the offside, and the line of the windscreens above that rather nasty "gash" grille suggests that the engine mounting may also have been higher compared to "conventional" Wulfrunians. Except for the added complexity of air-suspension its hard to see what couldn’t have been offered by an Arab, and you’d have thought a small municipal operator might have been best advised to steer clear of needlessly complicated design features – unless the set-back front axle offered a tighter turning circle that was needed for a particular route? . . . I’m eager to read Phil’s explanation come the new year! According to R N Hannay’s book on the marque, 35 VTF was new to Accrington in 9-61 and sold in 1-68, acquired by Ronsway in 3-68 and disposed of 9-69, acquired by Byley, Middlewich in 10-69 and disposed of in 2-72 for scrap. 36 VTF was new to Accrington in 10-61 and sold in 1-68, acquired by Ronsway in 3-68 and disposed of in 8-68, acquired by Biss, Bishops Stortford, in 8-68 and disposed of 5-70, acquired by Gilbert (Avro) Stanford-le-Hope in 6-70 and disposed of in 8-70, acquired by Spencer, High Wycombe in 9-70 and disposed of 7-71 for scrap. Await PB,s article with great interest. I wonder, with the staircase being at the back if this eased the load a little on the front suspension. The dates John quotes from Hannay seem to match the information I have about my bought slide. Diesel Dave’s memory is, of course, entitled to be suspect as the event was over 40 years ago. Now, what was I doing yesterday??? Eric, I doubt the position of the staircase would remove that much load from the front suspension. If the manual gearbox is mounted further forward than the mid-mounted underfloor semi auto on the front entrance ones then that could also add to the load at the front. On a group some time ago Dale posted an interior view of this bus on this trip. It had a bulkhead in the lower saloon in the conventional place with five rear-facing seats. In fact it looked fairly conventional downstairs. I have a memory from around 1970 of following VTF35 eastwards over the "Cat & Fiddle" towards Buxton. It made very slow progress indeed. I seem to remember it still wearing Accrington’s colours. At the time, I thought it was with a majorettes’ troupe, but it was probably on hire from Byley Stores & Garage Ltd. (a wonderful name for a bus operator) from the Middlewich area. It was probably bought via the local dealer, Martin’s of Weaverham. Google throws up a view of it in Byley’s cream and red livery. I am quite happy to accept that the date of this trip was indeed March 1969 as my original date was only a very rough guess as I admit to the sin of not making notes of dates etc. I can shed some light on the queries raised regarding the cab area which was in fact very much like Southdown’s PD3’s with a large hinged bonnet panel hinged along the centre line which along with the N/S external door gave access to the engine as it also had a Cave- Browne- Cave heating system fitted, shown by the grills either side of the destination display, there would have been no radiator in the engine bay the person seen next to the driver is in fact kneeling on the bonnet. The engine was indeed fitted in the centre of the chassis making the drivers cab much more roomy than the normal Wulfrunian set-up. With regards to the position of the fuel tank I have an O/S photo of the bus which shows the filler cap to be behind the rear wheel arch indicating that the tank was most likely under the stairs, I don’t have any idea about the position of the batteries however. I seem to remember that it gave a reasonably comfortable ride and the heater system was quite effective but as Peter says my memory is not always as good as I would like. Finally I’ll take this chance to wish Peter and all the many other contributors and readers on this site all the very best for Christmas and the New Year. I’m beginning to get this, and await Phil with interest… Did they have a "normal" height floor because of the central transmission with a step into the saloon from the platform? …and therefore room for all the stuff under the floor, as usual…. could there even be a shorter front overhang, so less see-saw & a bit less toe-out: are you sure this isn’t an Arab 6! The gear box was in the same position as the semi automatic box and the batteries were at the immediate front nearside in a tray forward of the nearside access to the engine at the lowest level of the chassis. There were five seats across the front bulkhead. If I recall, and the chassis photo seems to bear this out, the floor was flat. The fuel tank was under the stairs. I’ve finished the article which includes more info and a link to a photo of the actual chassis and submitted it to Peter. Well done, Joe! 35 and 36VTF were indeed the prototypes for the Arab VI. Needless to say, the style was far too complicated for even the operators of the Wulfrunian! Perhaps a Wulfrunian/Arab cross would be more accurate as the vehicle description is Guy Wulfrunian based on the chassis numbers which were FDW74920 and FDW74970, the W indicating Wulfrunian. The Wulfrunian was unusual in being one of the few models to be built in front, forward and rear entrance format. Most were front, Accrington’s were rear and Wolverhampton’s 71 had a forward entrance. I was going to say this was unique but the same can be said for the Routemaster if the solitary FRM is included. I was led to believe that Accrington bought the rear entrance pair because Guy had withdrawn the Arab from sale at the time and wanted to standardise on the Wulfrunian. No doubt Phil will enlighten us and I too look forward to his post. Whilst Guy announced they would finish regular production of the Arab IV in 1960, they continued to build examples for regular customers and did so until 1962 when the Arab V was available. Lancashire United, for instance, took batches in 1961 and 1962. Having emerged from my post Christmas lunch haze, I can add Burton, Chester and Wolverhampton to the list of operators which ordered and received Arab IVs between the official finish of production in 1960 and the arrival of the Arab V.
I’ve been trying to work out where the idea of an Arab VI referred to by Joe and Pete comes from. The Wulfrunian was already a failure and the Arab V design was well under way when Jaguar took over the company and there is no way Jaguar would have countenanced trying to sell anything new that resembled a Wulfrunian, although they kept faith with West Riding by fulfilling their orders and giving spares and engineering support to all operators as did British Leyland. The only mention of an Arab VI I can find is on the Internet pages of the Outer Circle Bus Tours of Birmingham where a typo has their 2976 as an Arab VI. I suppose you could add to that the Daimler Fleetline. Obviously the vast majority were front entrance but thanks to Mr. Ronald Edgley-Cox we have Walsall Corporation’s two "extreme" Fleetlines, the 25ft long no.1 which only had a forward door, and ‘Big Bertha’ XDH 56G the 36ft Fleetline that had a rear exit. I wasn’t being entirely serious. It just seemed that having centred and raised the engine with central transmission (and raised the floor?) and reduced the front overhang to something not far off a half-cab, the result is getting more Arab than Wulfrunian. I was thinking along the same convoluted lines as Joe was. Sorry if I upset the equilibrium! By an odd coincidence I emailed a pal recently with visions of a Guy Arab VI, to be a low-floor rival to the Bristol Lodekka, and then what do I see but Joe and Pete’s references to the same phantom bus! All of which prompts me to wonder whether Guy actually did have such plans. I’d hate to have seen Dennis’s market undermined, but investing in a drop-centre axle version of the Arab V might have saved Guy–at least for a while. The date of the visit to Gosport & Fareham by Wulfrunian 35 VTF was Sunday 30th March 1969. ‘Twas me who organised the trip on behalf of the Eastbourne Lion Preservation Group, owners of Leyland Lion JK 8418. It’s interesting to speculate regarding further Arab development. The Arab V design was well under way in the drawing office as the Wulfrunian was being launched so Guy obviously had decided to hedge its bets and cater to its more conservative client base as well as tempting Gardner devotees with the Wulfrunian, presumably in the hope of winning orders from Daimler customers wanting an Atlantean style bus, as the Fleetline was not announced until the year following the unveiling of the Wulfrunian. In this they were doing nothing different to Leyland and eventually Daimler in offering an advanced design alongside basically traditional models. Where they went awry was in trying to pack in every new and basically untried idea into one chassis and, having seen Foden’s and Leyland’s efforts with rear engines, then almost contrarily kept a traditional engine drive train layout, albeit with a drop centre rear axle. I remember attending an airshow at Church Fenton in 1967 where West Riding had the contract for public transport onto the airfield and provided no less than 30 Wulfrunians – a mixture of the red and green fleets. By that time the type’s reputation was irretrievably mud and Guy as a marque was on its last legs yet, for all its problems, the type looked very modern and much more designed than the Fleetlines and Atlanteans that were my daily fare in Manchester. Had the phrase "keep it simple stupid" been in common parlance in Wolverhampton in the late 1950s, Guy may well have produced a front engined, front entrance double decker with a flat floor, a synchromesh or even a constant speed box which would have been a front entrance Arab. They could then have introduced the fancy brakes, suspension, whatever gearboxes and anything else as options or improvements after thorough testing on mule chassis once the type and layout had gained acceptance and orders. The extra two and a half inches width available from 1963 would have been useful to increase the driver’s cab and the introduction of ergonomic design during the 1960s could have further enhanced the driving experience. Certainly the experiences of Atlantean and Fleetline operators in the early 1960s left the door wide open for a simple, front entrance double decker but even Volvo, a decade and more later with all their inventiveness and sales clout only sold just over a thousand B55/Ailsa, penny numbers compared to the relatively more complex Atlantean and Fleetline. There is no doubt that the Arab V was a good bus. LUT, for one, loved theirs and, having tried Fleetlines, kept ordering the Arab – simplicity and reliability overcoming any worries about the vehicles looking dated to the passenger on the street. I’ll only digress briefly here, but I was always sad that the Ailsa Volvo had such limited success. I had quite a bit of experience in driving three of them, and have ridden in many more. From the driving perspective they were superb, with faultless road holding, and the skilful design of the front platform and staircase area gave perfectly adequate passenger circulating room. The performance, particularly with such a tiny engine (albeit turbocharged), was quite amazing although admittedly when fully laden uphill they took their time. The three which I drove were GCN 1/2/3 which were disposed of indecently early by Newcastle’s PTE successor – I forget the exact circumstances but I seem to recall that there was a TGWU issue and that the original braking system left a little to be desired under heavy workloads – this was taken care of in the later bulk production. To the enthusiast driver the transmission was a joy and, at the risk of a volley or protest from the Southall area, gave a very likeable aural impression of a Mark 111 Regent. The usual Alexander body was handsome, well finished, and the vehicle handled 79 seated passengers plus standing very well indeed. I can’t comment on how the engineering folks found the Ailsa but I wish its success had been more widespread. It is interesting that the Wulfrunian is now seen as a complete failure in concept and in execution. However, a test several years ago by the Classic Bus magazine (in its vastly better days under Gavin Booth) concluded that the Wulfrunian was far from being the "Blunderbus" that it has often been labelled. Certainly, during my time in Halifax in the mid sixties, I took many opportunities to ride upon West Riding Wulfrunians around Leeds and Wakefield, and I found their road performance to be impressive. Certainly some of the advanced engineering features proved troublesome, but most of these would have been sorted out had the Guy company not landed itself in a precarious financial state by expending huge sums in setting up its own sales outlets in South Africa in 1955. By the time that the Wulfrunian’s reliability problems emerged, Guy was technically insolvent, and there was no money available to eliminate the shortcomings. One major defect lay in the braking system, which was hydraulically operated with air assistance. The shrouding effect of the bodywork, plus the front location of a hot engine and its exhaust pipework, caused the brake fluid to boil and destroy all brake action. The fitment of a full air braking system would have eliminated that problem entirely. Other problems could surely have been sorted given the cash – the early Atlanteans had some major, costly faults that were ultimately designed out – but Guy had no funds to remedy the Wulfrunian’s failings. Some information on the Wulfrunian may be found here at this site. It’s many years since I saw the leaflet which forms the basis of the piece linked to in Roger’s post. If you read the blurb in the knowledge of Guy’s parlous financial position, it becomes clear that the Wulfrunian was their great white hope – or their vehicle of hopeless optimism. It reads as if they have found, in one design, the panacea for all the problems of the industry. Claims about the chassis versatility for different body formats and claims regarding the input of various operators have, in hindsight, shades of how they designed a camel to respond to the need for a racehorse by throwing in every idea they had been given and every technical development they could find. Of course the major flaws are highlighted in the opening sentence and the list of salient features. The arrogance of the sentence "Air suspension development at Guy has now reached a virtual end" towards the end of the piece really shows just how the company had deluded itself into basking in the glory its golden dreams of conquering the market with its yet untried product. 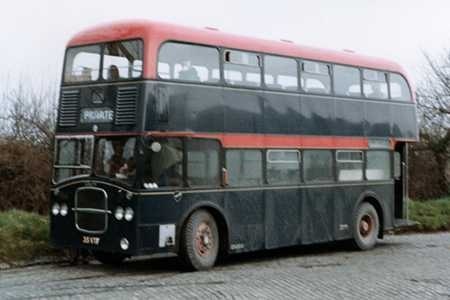 By the time the Wulfrunian was launched, Leyland had scaled back its Atlantean to a much more simple vehicle albeit with faults and complications. Had Guy not been so desperate for cash flow, they too may have taken a second look and offered a simpler vehicle capable of development alongside its proven Arab. Chris Youhill rightly praises the Ailsa I travelled on both Alexander and Van Hool bodied examples and found both a very pleasant vehicle for the average passenger. As to the sound effects superb! Some of the late lamented Black Prince’s examples sounded like London tube trains in their later years! That technical leaflet is revealing, Roger: operators are looking for simple vehicles with reasonable comfort/ride and running economy. Although a Wulfrunian running was a good vehicle – with Gardner engine & Roe body it had to be- but there seem- even to a layman- to be some awful design flaws. Trying to squeeze the driver, old-style engine and single entrance/exit and even the staircase into the one width seems pretty dotty. That’s why the Accrington version seems better. I love the bit about having to clamber over the engine to reach the driver- were they ever OPO? (or then, OMO?) Having so much weight cantilevered at the front seems dotty, too: and look at the exhaust…. wrapped over the front suspension… and the fuel tank, desperately balancing the two equal but light/heavy overhangs but surely so vulnerable to a rear full/quarter shunt. And why are they so proud of no power steering? Was it untried technology then? On the other hand, cars at that time found 4 wheel disc brakes difficult…. wasn’t it never park a Mk2 Jag on the handbrake alone? For those interested in why Accrington bought their oddball Wulfrunians, the answer is in my article "Days Out With Martin Hannett"
Re the Accrington Wulfrunians, I remember driving south on the A5 in 1968, going home after a day marshalling at Mallory Park race track, and I believe I saw one, possibly two of the Accrington buses in a scrapyard, on the east side of the A5. Reading the above comments makes me doubt what I saw ! Was I mistaken, or was the site being used by someone operating the Wulfrunians ? I will always regret that, when I was in Bradford in late 1971 – sampling the last few trolleybus routes – I spurned the chance of a ride on a West Riding Wulfrunian which was waiting at an on-street terminus.It was in green livery.